A nice way to add some warmth in a house, without spending too much! 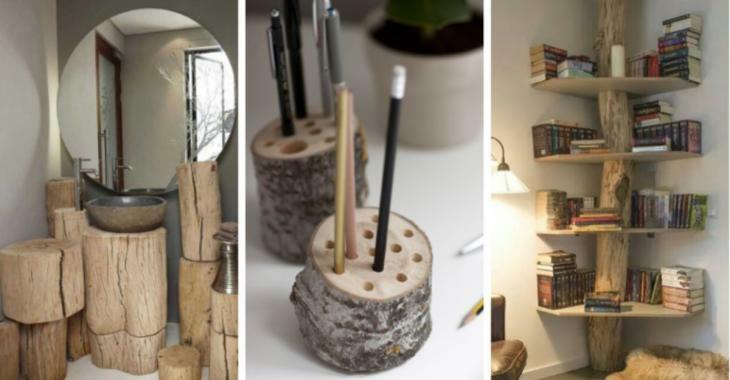 You will find amond these ideas, good ways to add warmth to the decor without spending too much money, because if you're a handyman or handywoman, you'll be able to make these decorations from trunk, logs and tree branches. If you like the warmth of wood and its authentic side, this is for you. Even in an industrial decor the wood is beautiful. So, if you are looking for a way to make your home a little more welcoming. See these 20 beautiful ideas. You will surely find something that you like. 1) A log of wood can easily be modified to fit into a very modern decor. 2) A handrail like this has a lot of charm, don't you think? 3) You will never find a table like this in a shop, even in a very trendy shop. 4) Make a headboard with birch wood. Your bed will be unique. 5) This Scandinavian-style bathroom is decorated only with logs of wood. 6) We can even make lamps! 8) It's very simple to make a flowerpot with a log, just apply a sealant inside. Get information in your hardware store, to know the right product to use. 9) A stump and glass plate to make a beautiful coffee table. 10) Wood has no limit, don't transform it, simply use its shapes ! 11) A tree trunk can also support corner shelves. 12) Cute ! Here is a great idea to make a beautiful bird feeder. 13) Succulents don't need too much soil to grow. Carve a tree trunk to add some soil and this is a very original flowerpot. 15) To make a bed canopy! 16) WOW! The shapes ! By reusing the legs of another table, it is possible! 17) If you like raw wood. 18) The mix of modern, wood and plants ... wow ..
19) Perfect to decorate a table! 20) Paint only the bottom part in white. Do you like all these beautiful ideas? Share them!